There’s nothing worse than pulling your pool cover back to discover your beautiful swimming pool has become a breeding ground for algae. Turn your back for even just a few days, especially after a rain or some heavy pool use, and you could be rewarded with an infestation of algae you now need to clear up. Luckily, you’ve got the option to buy algaecide, which is one of the best ways to treat various types of algae, and ensure your pool stays algae-free and ready for a swim. We hand-picked the following pool algaecide products based on their popularity, price-points and differentiating features. To kill and prevent the further growth of algae in your water, you need pool algaecide. It’s a chemical treatment you can use if you’re having a problem with algae in your pool. While shocking your pool with chlorine is the most effective way to solve most algae issues, pool algaecide works best as a preventative step, to stop the algae from returning. It’s smart to include an algaecide in your pool maintenance routine, especially when you’re opening or closing your pool for the season. Warm weather, levels of direct sunlight, and even problems with your filtration system or pH balance can trigger algae growth, and it’s essential you keep the algae in check, so your pool remains safe for swimming at all times. We use the term “algae” to classify the different types of microorganisms that thrive in backyard swimming pools once the chlorine balance gets out of whack. Green algae (or viridiplantae) is the most common and also the easiest to kill. It blooms cling to the sides of your pool and hang in the water, forming after long periods of neglect. Yellow/brown/mustard algae (or stramenopiles) is next up, and this one grows in shady corners and can look a little like pollen or sand building up in your pool. Black algae (or cyanobacteria) is the toughest to kill. This is actually a bacterium that thrives in still water, and uses thick cell walls to fight against the chlorine in your pool. Fun fact: Pink slime (or oubacteria) is often incorrectly referred to as “red” or “pink algae”, but it’s not actually an algae. It is, however, fast spreading, chlorine resistant and not reliant on sunlight to grow. 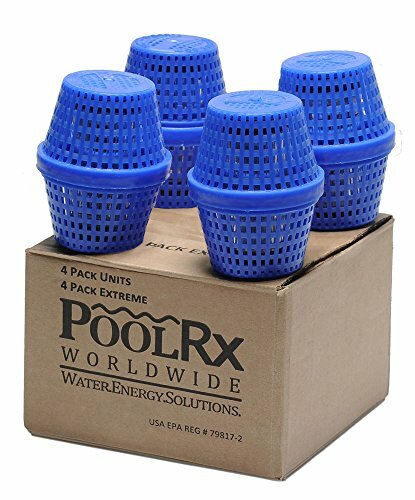 What Types of Pool Algaecide Can You Buy? Sure enough, due to the different types of algae, there are also different types of algaecides on the market, enabling you to choose the right product to eliminate the particular strain of algae you are suffering with. Quaternary Ammonium compounds, or what we call “Quat” pool algaecides are technically a detergent used to kill most types of algae in your pool. You know how dish soap breaks down the grease on a frypan? These algaecides work similarly, attaching themselves to the algae cells and dissolving their protective membrane. So, the chlorine penetrates to the core, and the algae die. Typically, these are the most economical type of pool algaecide, which is available in 10% and 50% concentrations. Of course, adding too much of this type can cause foaming (because it’s basically soap), but unlike metallic algaecides, there’s no risk of staining your pool. Polymer pool algaecides are a variant of the Quat compound but have been engineered with two distinct advantages over other algaecides. They are both non-foaming, and non-staining. Working similarly to quat algaecides, the polymers quickly attach to the negatively charged algae cells, spreading over the algae bloom and smothering the growth, until the algae meet the same fate. It is, however, twice as effective and longer lasting than Quat algaecide, but they’re also one of the most expensive algaecide variants. These come in 30% and 60% concentrations. Using positively charged metal ions, metallic algaecides attack the outer cell walls, poisoning the nucleus of each individual algae cell, to kill off an infestation. The most common are copper-based, and while very effective, over time the algae can develop a resistance to the treatments. 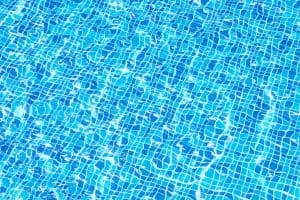 You also need to be wary of over-use, which will cause staining on your pool surfaces. If you’re tackling a black algae infestation, silver algaecides are a practical option to kill these hardy algae blooms. Though not explicitly classified as an algaecide, Sodium Bromide is a great way to prevent and kill off algae in your pool. It works in tandem with your pool chlorine levels to keep algae in check. 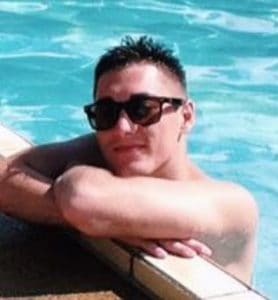 As the sodium dissolves, the bromide is oxidized by the chlorine in your pool to form hypobromous acid (HBrO) which is a potent algae-inhibiting chemical. The only downside is this reaction will drop your free chlorine levels so you will need to keep an eye on the balance of chemicals in your pool. Quat vs Polymer vs Metallic: Which is Best? Quat algaecides are the most cost-effective, but you need to be very careful not to add too much solution as it will create a foamy mess in your pool. Polymer/polyquat algaecides are an alternative that will not stain your pool or foam up, though you will pay more for these highly-engineered solutions. Metallic algaecides are perhaps the most effective algaecide, it’s just important to realize that the introduction of copper into your pool can lead to stains. Overall, I’d recommend using a polyquat algaecide, it’s the best product to keep algae at bay, without the risk of foaming up or staining your liner and pool walls. Let’s go over some of the main criteria you should apply to your decision making process when looking for the perfect algaecide for your swimming pool. What Type of Algae Do You Have? Before buying any algaecide, you need to determine what particular strain of algae you’re dealing with. You may need to hold a sample against a white background to see the tint of the color, though the color should be clearly evident in the spots where it’s blooming. Green algae are easily recognizable from the green-blue color it turns your water, it thrives in warm water, with plenty of sunlight. Yellow algae are similar to green, though it has a distinctive yellow color in the blooms. You don’t need sunlight for these particular algae to thrive. Black algae are the hardiest, collecting on the sides of your pool to look like mold, where it can lay down roots which makes it very difficult to remove permanently. One of the most important considerations for an algaecide is the impact it has on your pool, and that the chemicals it contains won’t damage your pool structure or any components. Typically, there will be a warning on the package if this is a concern, but you can mitigate any problems by following the directions to the letter. In general, copper-based metallic algaecides are the ones to be particularly careful with, as they are notorious for causing stains if misused. Can You Swim Soon After Using It? Most algaecides are perfectly safe to swim after use, though it’s a good idea to wait 10-15 minutes before jumping in, just to be sure the chemicals have properly dispersed. Be aware that copper algaecides can add a slight blue or green tinge to your hair, especially if you’re exposed to a high concentration. Always read the instructions to use the right dosage, and wait the recommended time before swimming. Quat algaecides are perfectly safe to swim right after use, but overdosing your pool can cause foaming which will obviously make for an unpleasant swim. The longer the active ingredients last, the less frequently you’ll need to reapply the treatment in your swimming pool. Some particular algaecides offer 90-day protection, while others can last for up to 6 months in your water. Either way,keeping algae at bay requires a consistent approach, and should be a regular part of your ongoing pool care. Pool algaecides are not an expensive product, but because you’re regularly using them to treat your water, they do an ongoing cost for keeping your pool algae-free. The different types of algaecide vary significantly in what they cost, Quat’s are generally the cheapest, followed by the metallic, with the Polymer algaecide the most expensive. The key is to find an algaecide that has value, balancing the cost against the frequency you’ll need to be using it in your swimming pool. So far we’ve covered what a what pool algaecide is, why you might need it, and what features are important to focus on. 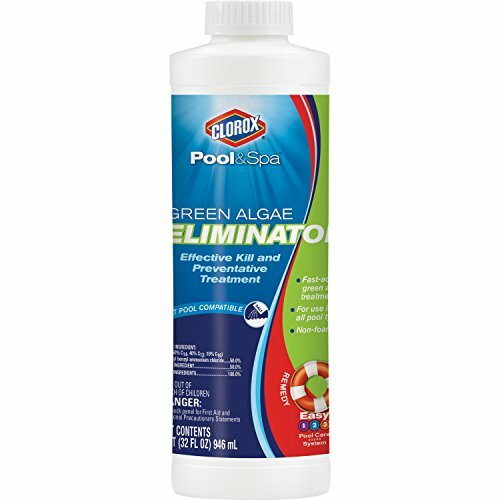 Designed by Clorox Pool & Spa, this is a quat algaecide that works to both prevent algae for blooming and kill off any that is already in your pool. 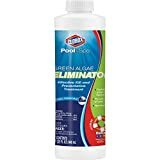 Suitable for all types of pools, this particular algaecide claims to be both a non-staining and non-foaming product, though overuse will cause foam as it is a soap-based product. What I like best is how fast it works against Green Algae, it’s just not that all effective against the other types of algae that you may need to tackle in your pool. Designed by Kem-Tek, this is a non-foaming polymer algaecide that not only helps to kill off any algae present, but also clarify your water. Featuring a strong 60% concentration of the active ingredient, this particular algaecide is just as effective as a preventative step as it is to treat an algae-infested pool. What I like best is the non-foaming chemical reaction, and that it’s one of the highest strength polymer algaecides you can buy. But it’s really only useful on green algae. 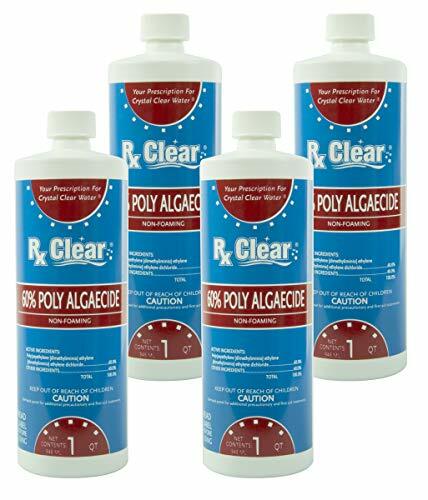 Designed by Rx Clear, this is a non-foaming polymer algaecide that leaves zero residues, while working to eliminate the algae growing in your pool and on the walls. Working fast as soon as it’s poured into your pool, the chemicals are safe for swimming immediately, so you’re not missing out on any valuable pool time. What I like best is that this particular product works on green, yellow and even black algae, requiring a dose of just 4 oz. every 2 weeks per 10,000 gallons of water. The only downside is the need to stick to the doses, or you’ll end up with a foamy pool. Designed by In The Swim, this is a metallic algaecide containing 23.5% copper triethanolamine complex (an active ingredient of 7.1% metallic copper). Highly effective against all types of algae, it’s safe to swim immediately after use, and will eliminate the algae in your pool in a matter of hours. What I like best is the non-foaming formula, and just how powerful it is in killing off a bad algae infestation. The biggest downside is the care you need to use, overdosing your pool will stain both your liner and walls and can even add a green tinge to your hair. Designed by Pool Rx, this is a metallic algaecide that uses a proprietary blend of minerals to eliminate and prevent algae growth in your swimming pool. Able to take highly infested pools back from the brink in just a couple of days, the on-going preventative effects of the dissolved minerals will remain in your pool for up to 6 months. What I like best is how easy this particular product is to use, just drop the unit in your pump or skimmer basket, and it will continue to work. The only downside is the spike in copper levels can turn your hair slightly green, especially in the first couple of days. Designed by SeaKlear, this is another metallic algaecide containing 11.8% copper sulfate pentahydrate, to kill and prevent the return of all types of algae. Works effectively against green, yellow and black algae, it’s a non-foaming solution that dissolves fast, without impacting your pH levels. What I like best is that it’s EPA registered (unlike some of the other algaecides), and it comes with a guarantee to keep algae at bay for 90-days. The biggest downside is an overdosage will stain your pool, so you need to pay particular attention to the instructions. 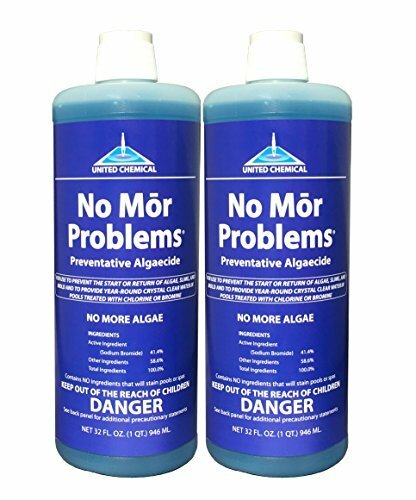 Designed by No Mor Problems, this is a protective chemical for your pool that uses sodium bromide as the active ingredient in keeping your water clean. Not specifically an algaecide, the patented formula helps to sanitize your pool, enhance water clarity, and also restricts algae growth. What I like best is how this product makes your pool maintenance more manageable, reducing the frequency with which you need to shock your pool and change out your filters. All things considered, the algaecide from Rx Clear is the clear winner in this category. Safe enough that you’re able to swim immediately, it’ll work to keep green, yellow and even black algae at bay. Just remember to stick to the recommended dosage levels, or you risk ending up with a foamy swimming pool. In second place we’re recommending the 90-Day algaecide from SeaKlear. Dissolving fast in your pool, it’s highly effective against all types of algae, with a guarantee to keep algae levels down for 90 days. Again, you need to be careful with the dosages, too much of this in your pool can stain your liner (and walls), and also your hair when you swim. Swimming in water infested with algae isn’t a pleasant (or sanitary) experience. 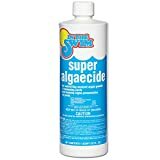 So, do yourself a favor and make sure you’ve got pool algaecide on hand to fight off the blooms, and are using it regularly to stop the algae coming back.